There's a lot of love for Yotam Ottolenghi, for his Middle Eastern/Eastern Mediterranean fusion cooking, his mini chain of upmarket delis, and for his best-selling range of cookery books. In a city plagued by "me too" copycats and bandwagon-jumpers (seriously, can we stop with the dirty diner joints now? Even I'm bored by them) Ottolenghi stands as a rare example of a style and philosophy of food that is both unique and worldly. Healthy-food, rather than healthfood - all freshness and light and with exotic things like freekeh and pickled kohlrabi, not vegetarian but vegetable-focussed, it's genuinely revolutionary - you can see why it's been so popular. It just never really interested me. I'd see the queues snaking out of the Ottolenghi shops in calculatedly upmarket areas of town like Notting Hill or Belgravia and the first thing I'd think wasn't "that salad looks like an interesting and colourful take on near-Middle Eastern cuisine" but "that is an awful lot to pay for rabbit food". A "small" selection of three salads from the Islington branch, for example, is £11.50, and these may contain nothing more exotic than broccoli, green beans and mixed peppers. I could understand the popularity, I just could not myself get excited about salad. So perhaps making a reservation at his flagship Soho restaurant Nopi was a mistake in the first place. Having established I wasn't really the target market for this particular brand of vegetable-bothering, I could have cut my losses and gone elsewhere - Danish steakhouse MASH are doing a 50% offer on Toptable, and was just around the corner. But I like nothing better than to be proven wrong, and dinner with a vegetarian seemed the ideal opportunity to put my prejudices to the test. Perhaps I'd discover what all the fuss had been about all along. Long story short, I didn't. In fact, I left Nopi stung by an astonishingly high bill and not feeling that for the outlay I'd really received much in return. The irritations began with the menu, which is arbitrarily divided into "Nibbles", "Mains", "Starters/Dishes to share" (underneath the mains for some bizarre reason) and "sides", yet with no detailed explanations offered by the staff and no real clues elsewhere, we were left to wonder why, for example "Vegetable crudites" was a "nibble" and not a "side", or why "crushed beetroot, date molasses, dukkah" was a vegetable starter but "lavash, spiced carrot, pomegranate, spring onion" was a "nibble". We did our best. From "nibbles" we had a bowl of nuts for £4 (fine, I suppose, but four quid?) and a few slices of decent prosciutto dressed with pickled peppers. Around about this time, as well, some bread and oil arrived, and though the flavours were good, the bread was turning stale on one side. Given the prices charged elsewhere, it seems like extreme laziness to not slice fresh bread to order. Four tiny calçots, rather timidly roasted in comparison to the ash-coated, leek-thick Catalan style I'd had before, came with a thin, bland, vaguely mayonnaisey sauce and cost £9.50. Roasted aubergine weren't much better, being unnervingly fridge-cold, and perhaps it's for the best that we couldn't detect any of the advertised vanilla. My "main", a whole roast poussin, was not terrible. It looked the part, had plenty of flesh (only parts of the breast being slightly dry), and I liked the Vietnamese idea of serving it with lime and flavoured salt. It just wasn't particularly... memorable. The skin was soggy with some kind of molasses marinade, and there was no escaping the cloying sweetness (even the bones were slightly pink with a clearly lengthy marinading process) other than to coat it with lime and salt. Chilli sauce was pretty dull too. "Persian love rice", the other main, was (you won't be able to tell from my godawful photos) pretty and colourful, and the pickled kohlrabi had a particularly nice flavour. Providing texture was a little pile of lotus root crisps, and next to it a sharp and refreshing "courgette tzatziki". It was a perfectly nice collection of hardly earth-shatteringly dazzling vegetables, which cost £19. And that's too much, as is £5 for a small plate of freekeh with (undetectable) jalapeños - this was in every way like one of those salads you get in the little plastic boxes at M&S. After all my moaning, I should probably repeat that despite everything I can see why Ottolenghi has his many fans. For restaurant-quality food that feels like it's doing you good, in admittedly impressive surroundings (the toilets are particularly interesting, like peeing in the Hall of Mirrors at your local amusement park) and served by attractive young staff that, in the main, didn't put a foot wrong, you can probably do worse. But our bill, with a couple of cocktails and a bottle of the cheapest wine, came to £132.19. And yes I know central London rents are higher but I also happen to know that at Peckham Bazaar (currently closed for renovation, but back open in April), a much more impressive range of Eastern Mediterranean dishes are being produced for a fraction of the cost. Yes, it's a bit further out of town and you probably won't have John Hurt sitting on the next table (as we did at Nopi). But your experience in every other respect will be infinitely better. So if you're not a diehard Ottolenghi fan, save your pennies for the bus fare and head out to SE15. 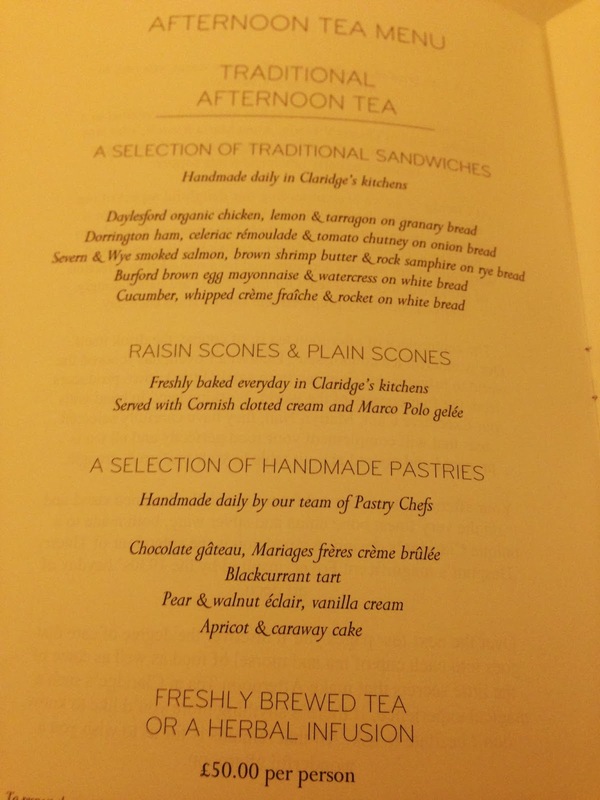 For a long time, I dismissed afternoon tea as a twee, anachronistic routine laid on purely for day-trippers and tourists. I was in no rush to drop half a ton on some cold sandwiches and cakes, and I saw little to recommend spending an afternoon in a stuffy hotel foyer surrounded by loud Texans in ill-fitting house jackets. Real Londoners, I thought, should avoid it in the same way we'd avoid the changing of the guard or Portobello Road on Saturdays - let's leave afternoon tea for the tourists, and cut our own crusts off some Boots Meal Deal sandwiches if we felt so inclined and head down the pub. In most cases, too, I still think I'm right - there are way too many places doing this kind of thing pretty half-heartedly (think bought-in sandwiches and cakes and packet jams) just so some timid out-of-towners can tick it off their "things to do" list, and none of them are cheap. They all suffer from that depressingly common affliction of anywhere popular with tourists - like Leicester Square restaurants and Madame Tussaud's, if you're going to be full anyway, why bother being good? So it's all the more impressive that despite all the reverse-snobbery and emotional baggage I took with me to Claridge's of a Sunday afternoon for a friend's birthday, I managed not only to enjoy a few hours of the most wonderful gastronomic theatre, but left with my mind completely changed about the ceremony of afternoon tea itself. That ceremony begins the moment you step through the handsome revolving door from Brook Street, onto the gleaming black and white marble floor, and up to the twinkly foyer restaurant. It's a building to take your breath away - luxurious, certainly, but refined and elegant in a way that nowhere else could dream of matching. Not even its closest rivals, the Dorchester or the Connaught or (arguably) the Savoy can manage this kind of effortless, stately glamour; even the odd modernist touches, such as the vast Dale Chihuly glass chandelier coiling out from the middle of the foyer ceiling, only seem to compliment the art deco twirls and flourishes and the floor-to-ceiling mirrors. The word "timeless" almost only tells half the story - Claridge's seems to exist in an entire enchanting, glittering dimension of its own. In this room, in this hotel, attention to detail is everything. And so, with the arrival of crustless finger sandwiches on a classic Limousin porcelain, anything even slightly out of place would have raised a (polite, gently disapproving) eyebrow. But the sandwiches were seemingly cut with a razor blade and ruler in immaculate rows, accompanied by delicate gougeres which dissolved into cheesy savouriness the second they hit the tongue. Sandwich flavours were traditional, but with the occasional unexpected twist. Smoked salmon, for example, was pressed not next to normal dairy but "shrimp butter" and samphire, adding an extra seafoody dimension, and roast chicken tasted of the highest quality bird and a mysterious note of tarragon. Once the savouries had disappeared, they were replaced (gracefully, almost invisibly) with mini scones, home made jam and quite honestly the best clotted cream I've ever tasted in my life. Dense without being cloying, tasting of farm-freshness and as bright as the driven snow, it was magical stuff, and we still talk about it. It would almost - no, it would, definitely - be worth going back just for that. And nothing so simple as "cakes" to follow the scones, either. No, instead here are four examples of the finest French patisserie, including a cherry cake with a handsome flourish of carved chocolate on top, an eclair with a gentle pear flavour, and a kind of blackcurrant medallion with an elaborate topping of soft meringue. Again, not a berry, base or button out of place. Some of us couldn't finish them (not me of course, but I was sure to cast a disapproving glance at those in question), and they were boxed up and tied with ribbons to take home. Teas are by expert tea-lady Henrietta Lovell, the house champagne is Laurent Perrier (of which we took full advantage), and on the way out you're encouraged to fill your own bags of Victoriana confectionary for the journey home. Everything gleams with care and attention; you can't - you literally are unable to - fault any of it, from start to finish. Well, almost everything. 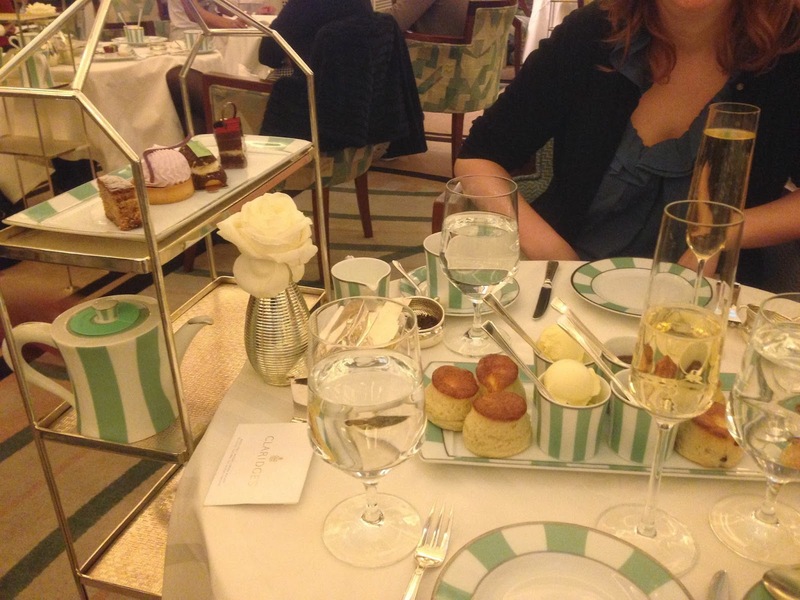 For as much fun and joy as afternoon tea at Claridge's undoubtedly is, blimey do you pay for it. The advertised £50 a head is just the start - with service, champagne and God knows what else (I don't think they even include tax as part of the inital £50 but I could be wrong, annoyingly I forgot to take a picture of the bill) you'll probably not get away with much less than £80 per person. 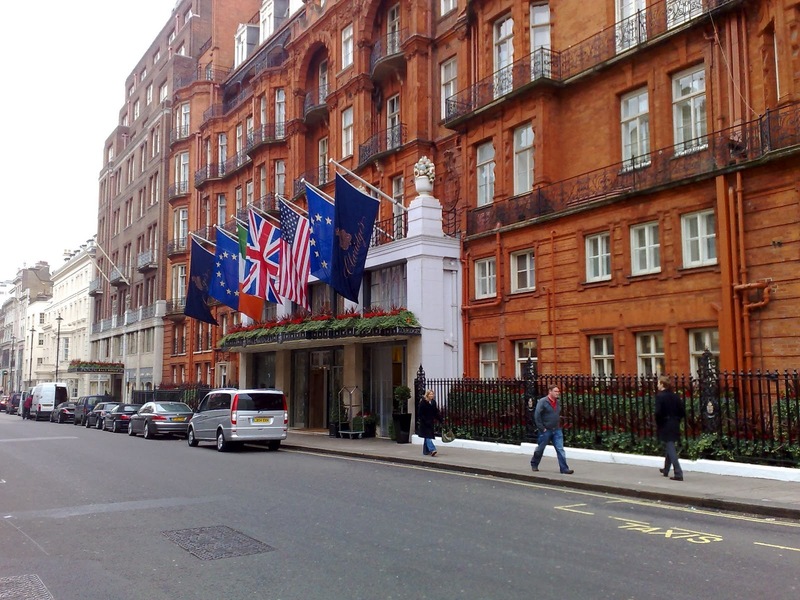 And I'm not so much of a hopeless Claridge's fan to understand that is way, way more than what most people want or are able to spend on tea and cakes. 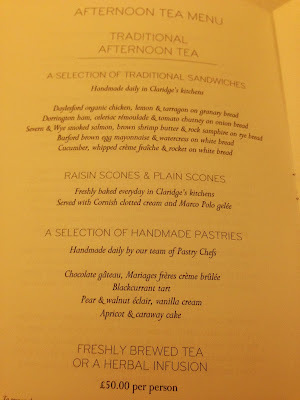 But what tea and cakes. And yes it's a lot of money but I honestly enjoyed this more than I've enjoyed many £80 dinners at restaurants elsewhere. 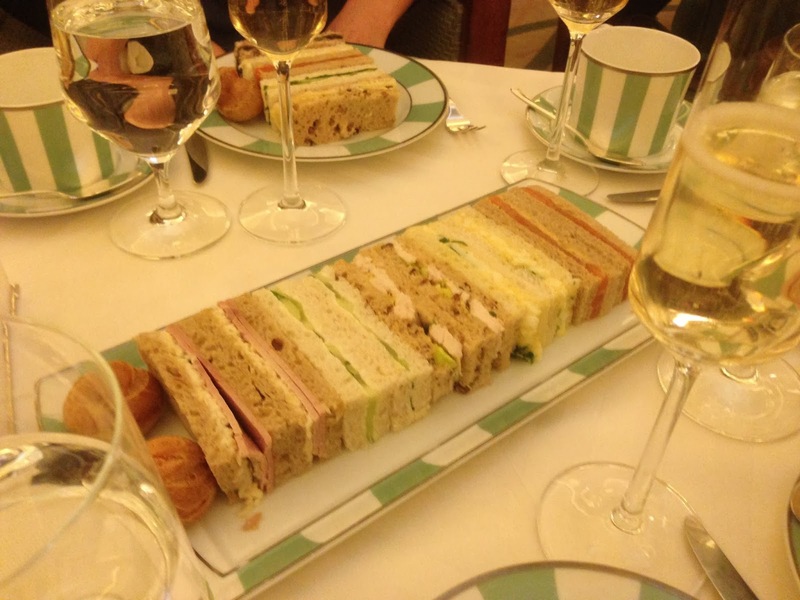 The cliché about afternoon tea is that the sandwiches and cakes aren't really the point, that it's more about the formalities and traditions and stealing glances at old Mayfair ladies with big hair than the food. This, in many lesser places, is certainly true. 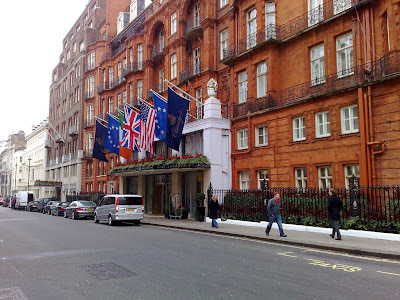 But along with all that, serenaded by piano and cello and in the most beautiful dining room in London, at Claridge's you also get food and drink of purest gold. Surely that's worth paying for, once in a while? Thanks Hannah and Alison for some photos. Much as I'm tempted to describe West London restaurant and foodie gastrotemple Hedone as "polarising", it's increasingly clear I'm just going to have to admit that when I have one opinion and the rest of the bloody world has another, that's not "polarising". That's just me being wrong. I didn't hate Hedone at all, but for the astonishing price and next to the tidal wave of hype from some of the biggest names in food in the capital, I just couldn't see what the fuss was about. But fine, OK, whatever. you win. Hedone is God's own diner and serving a poached onion on a plate is a work of genius. See? No egos here. But what do you do, as a Michelin-starred chef behind one of the most critically-lauded restaurants in town, when you get tired of being associated only with the foams and frills of fine dining and want to see if your meticulous (/dangerously obsessive/emperor's new clothes - delete as appropriate) approach to ingredients works in a less formal environment? And also, what if you don't want the expectations and hype behind your flagship kitchen to cloud customer's experience in the new place, where after all you aren't pushing for the same levels of international haute-cuisine? Well, you go undercover. The rumours of a "big name" chef casting his eye over the menu at Soho wine bar Antidote had swirled around Twitter and the blogosphere for a week or two, but it was only when one bright spark spotted a pear and cevennes onion gratin on the chalkboard menu that the pieces seemed to fall into place. We are, of course, talking about Mikael Jonsson of Hedone, and exactly how his influence breaks down is yet to be revealed completely, but we do know he is involved, and his new menu forms part of a wider refurb and revamp of this pretty little spot tucked around the back of Carnaby Street. Of course, I had to try the aformentioned pear and cevennes onion gratin, and as the most Hedone-like thing on the menu, again I was underwhelmed. The crust on top was golden brown and gently salty, and the sprigs of greenery had a lovely sharp dressing, but beneath this was a bland, semolina-like mush of diced vegetables, with very little to recommend it. But from here on, Antidote got better and better. Salt marsh lamb shoulder was beautifully cooked, and though weird at first the seaweed purée beneath actually worked well once the shock wore off, seasoning the meat with a deep, mysterious brine. Cheeses were perfectly kept and very well chosen. I tried a 2-year aged gruyere, which was quite salty but had a lovely smooth texture and plenty of nutty alpine charm. And a Camembert packed a great big punch of farmy goodness, and was so moreish that I timidly nibbled around the skin before finally giving up and ate that, too. But better even than the cheeses was the house bread, with a delicate crust and a bouncy, moist crumb, so fresh and light that whoever's making bread at Antidote (and it is all made in-house) should be very pleased with themselves indeed. And it's a gorgeous room, and the staff were charming and helpful and couldn't do enough for me, and there's even a quiet little outside terrace for when the weather improves or if you fancy a cheeky smoke. It's not even that expensive, although I imagine with a bigger appetite and a keener eye for the wine list (largely natural, I'm told, and with some real bargains though don't quote me on that) you could drop a good deal more than the £31.50 I managed on this lunch. For central, though, and considering the obvious effort that's gone into the food, I'd still call it value. Perhaps the most bizarre thing about the experience at Antidote is that, cevenne onion obsession aside, it's almost as different to Hedone as you could imagine. In fact, you could say, it's the anti- oh, I see what they did there.